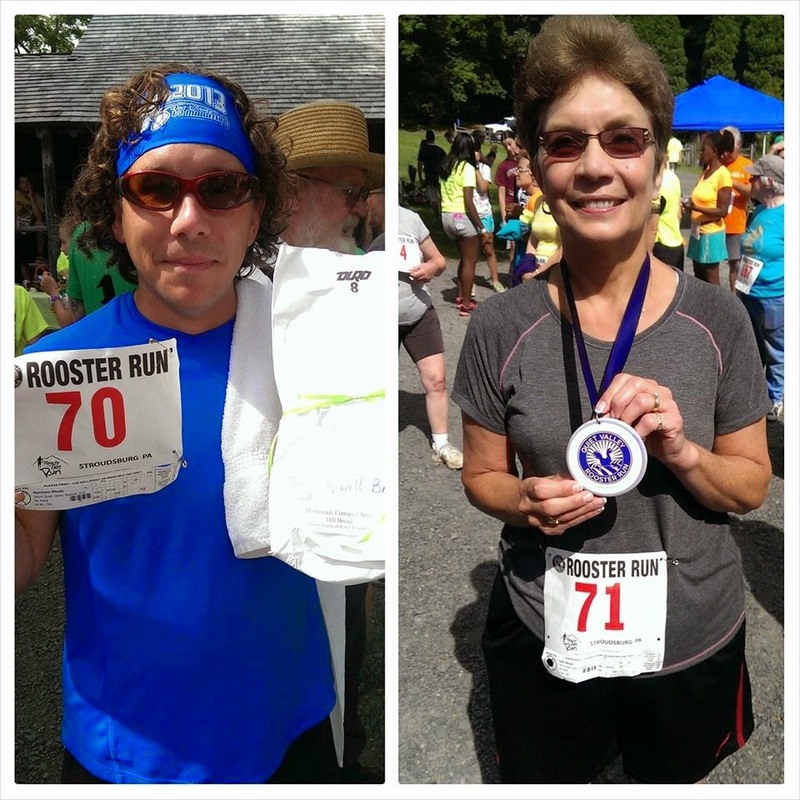 A few weekends ago, I ran the Quiet Valley Rooster Run with a bunch of my favorite people- Matthew, Sally (his mom) and Angie (family friend). 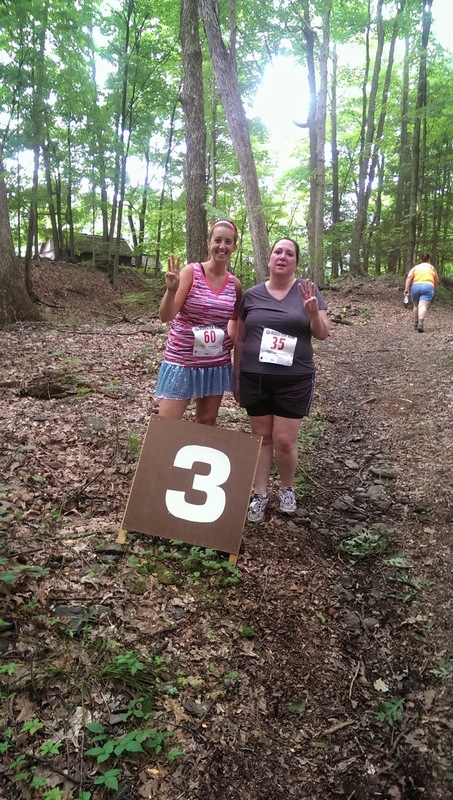 A few months ago, Angie had expressed to us that she'd wanted to run a 5k this summer- her first- so we found this Stroudsburg, PA race online and signed up. Then we went to OBX in June and Angie ended up running a 5k there too. So, even though this wasn't her "first"one, it was still special and we were excited to run it with her. Soon enough, it was time for us to line up at the start. 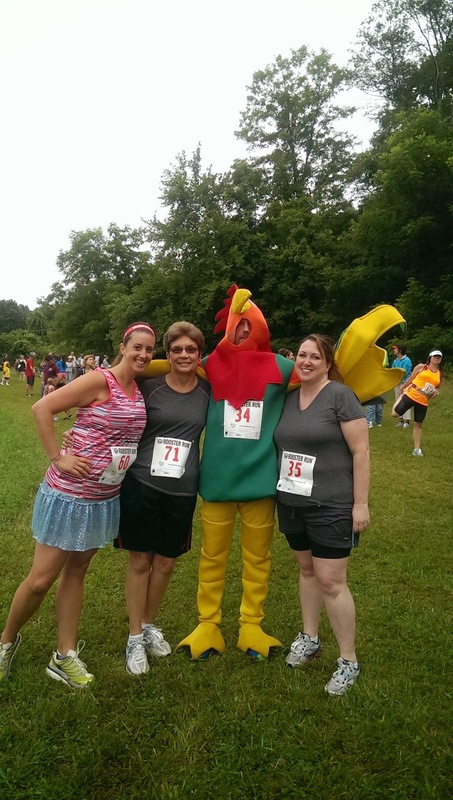 There were probably around 150 people participating in the race, including a man dressed in a rooster costume. 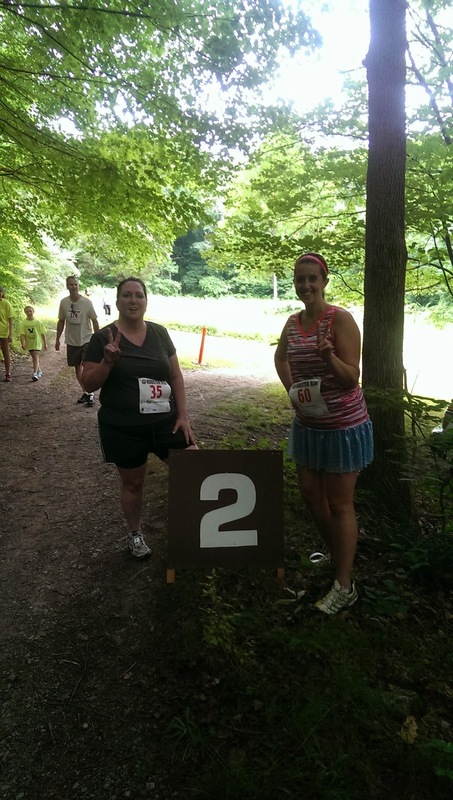 We started off slow, following Angie's pace. She'd been walking and running nightly with Sally in preparation for this race and we wanted to make sure we stayed with her. Almost like a Disney race, almost. Looking strong at the start! Me, Angie, and Sally. Let's just say this about the course- it was tough. Really tough. Parts of it were single track through the woods and there was a lot of elevation. I was pretty sure Angie was going to kill us when we were trekking up the insanely steep hill just after mile one :-) But, she held on and pushed through the pain to get up that damn hill. Made it to mile one! 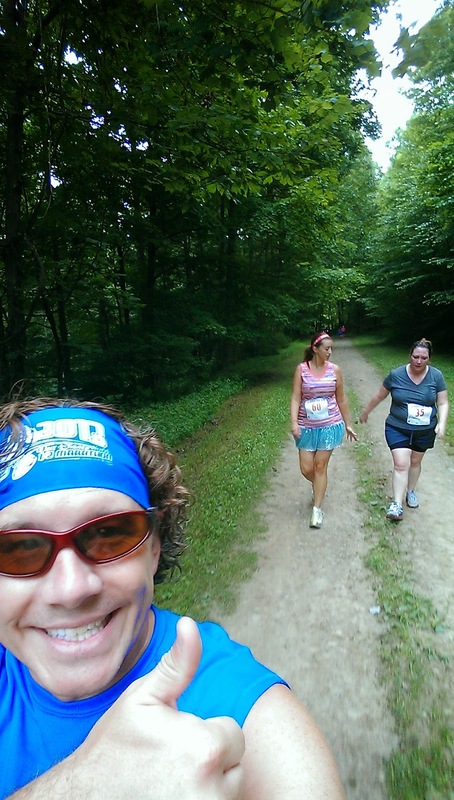 A little after mile one, Sally ran on ahead. Matthew, Angie and I chatted and worked our way through the rest of the insane course. It was really awesome to cheer her on as she powered through the miles- if there is ever a job where I can cheer new run/walkers during races, I would be set for life! 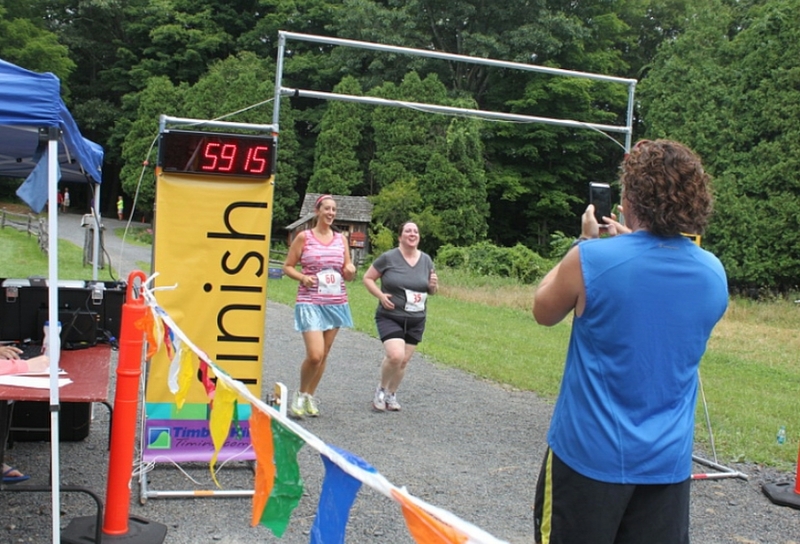 Our awesome photographer got some great shots of us as we worked towards the finish line. While tough, it was a beautiful course. Almost there! Check out the incline behind us- yikes! After we passed the mile three marker, Matthew ran ahead so he could get some finish line photos for us. Sally had already finished and was waiting there for us with Matthew's dad, Les. As we came down the last little stretch before the finish, we picked up the pace and crossed the line in front of our wonderful cheering section. Kudos to Matthew for this amazing action shot! Great (and free!) photo provided by the race. After the race, we enjoyed some watermelon, courtesy of the race organizers. There was a table full of raffle prizes and each person's bib was entered into the drawing. I had my eye on some homemade dill bread but unfortunately, my number didn't get called. But Matthew's did! It was delicious. 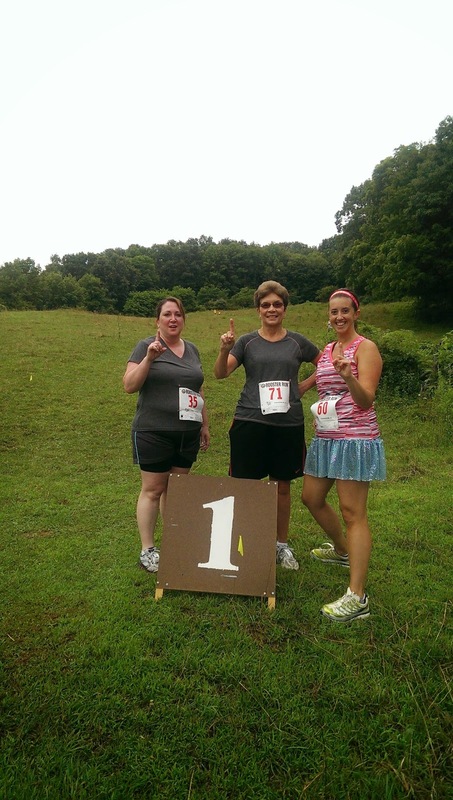 We also got another cool surprise- Sally won in her age group! She got the cutest ceramic medal. Overall, it was an awesome little race. 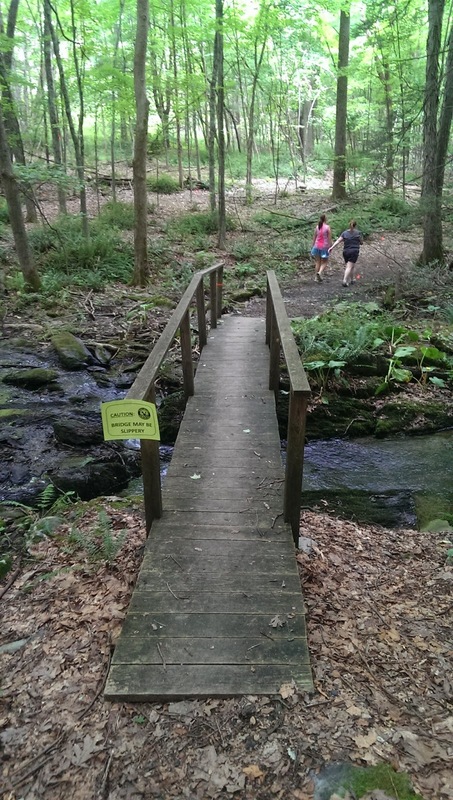 Challenging course, great organization, and a free entry into a fun raffle drawing. And of course, spending time with great people made the day that much better! 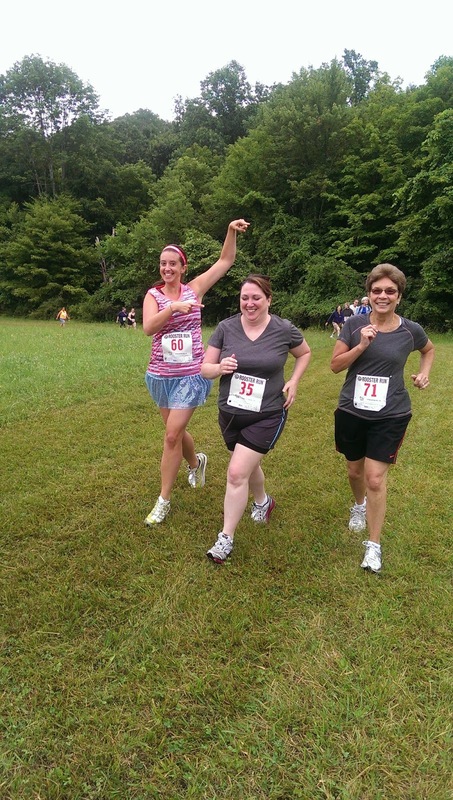 QOTD: Who's your favorite person (or people) to run with? Looks like you had a lot of fun, despite the difficult course. Congrats on another great race finish :) I always find races go by faster when I am with someone. 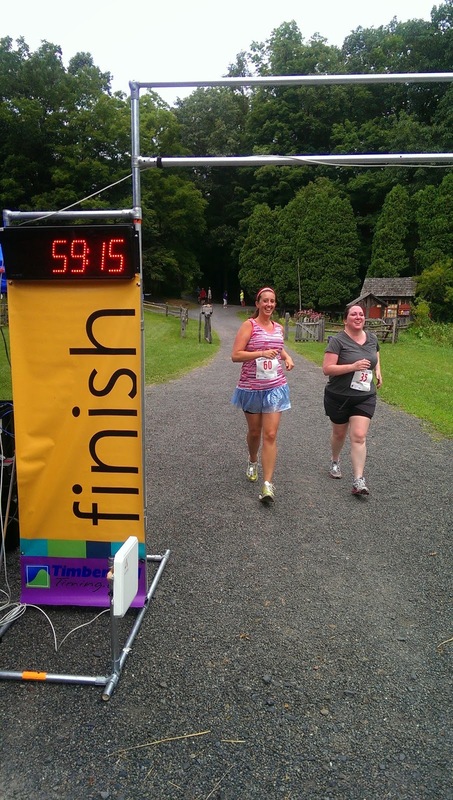 If I don't feel like running alone, or want to have company, I run with my mom (like at Disney races – way more fun to stay with her than to run ahead!). You find the most interesting races! I've been to Stroudsburg & heard of that historical farm but never would have thought there would be a race there. I need to expand my race horizons!